Home » Financial Planning » Save Money » Save Spend or Invest- How to Manage your Money? Save Spend or Invest- How to Manage your Money? When you start earning, money starts pouring in and the most vital question about money that becomes important is how to manage your money? The Personal finance education needs to start young in life as it is the basics of future. At every stage of your lives, when you earn money, you will be faced with 3 choices: save, spend, or invest. How you earn money and the way in which you implement these decisions will evolve with different phases in your life. Save, spend or invest- how you manage your money is the most important aspect of your financial planning for a prosperous future. A person who puts a portion of his pay cheque in a savings bank account of fixed deposit is fundamentally a saver. 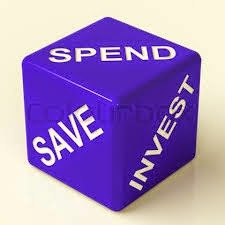 He may think of himself as an investor but from the point of this choice- Save, spend or Invest- how to manage your money? ,he is not. He objective is to withdraw the money many years from now and spend it. At that point he may become an investor because his objective will change towards getting an income from his money, but until then he is a saver because he gets no income. Saving money is one of the best habits people can take to increase happiness. A regular saving habit increase the satisfaction level of the person and give them a peace of mind as the cushion of having money to meet the family and personal expanses is quite important. If you have no money, it is not possible to meet out you necessary expenditure for today or tomorrow. Saving is the biggest tool to realize your dreams. If you want to make your dream come true like buying a house or a bigger car or most importantly going on travel to your choicest place, it is a must to save money. The biggest regret people have is that they did not save the money to fulfill their desire at the right time. In order to realize your dreams, start saving money early. We hope that emergencies won’t happen, but we all know that they do. A family member can develop a health issue, you might need to make an emergency trip, you may have a car to get repaired suddenly, severe weather could flood your house or you may have to pay for any other unforeseen expense. Any of these emergencies can be expensive, and we are likely to encounter some sort of emergency from time to time. So why not be prepared rather than potentially become another victim of an emergency. Spending is the act of disbursing the money you earn. You can’t save all the money you are earning as money is required to meet many daily expenses and to sustain. Whether to buy food, household goods, house, furniture and consumer durables as well as luxuries like car, fancy clothes, travelling, all this can be done only if you spend money. But while doing so it should be kept in mind that money is not everlasting and should be spent wisely. Finally, when you start earning, learn the best habit of saving early, spend wisely and invest your money prudently to build wealth and be financially secure in future. Indian indices settled down. Weakness in global stocks triggered a sell-off on the domestic bourses on last trading session of the week, Stock Tips.